Favole decks feature a common back design and 52 different stunning face card designs. The artwork is beautifully done –but with a dark side. Bicycle Favole Playing Card Decks are poker size, and they are made on premium, Bicycle brand card stock. The decks are available for immediate shipment. 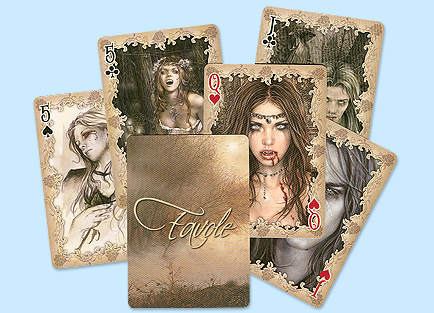 For more information or volume pricing on Bicycle Favole Playing Cards, please contact us at 1-800-233-0828.